You can give the gift of music to others all year long, and since you have the talent of crochet, you can use that to make your musical gift. Here are ten free music crochet patterns. 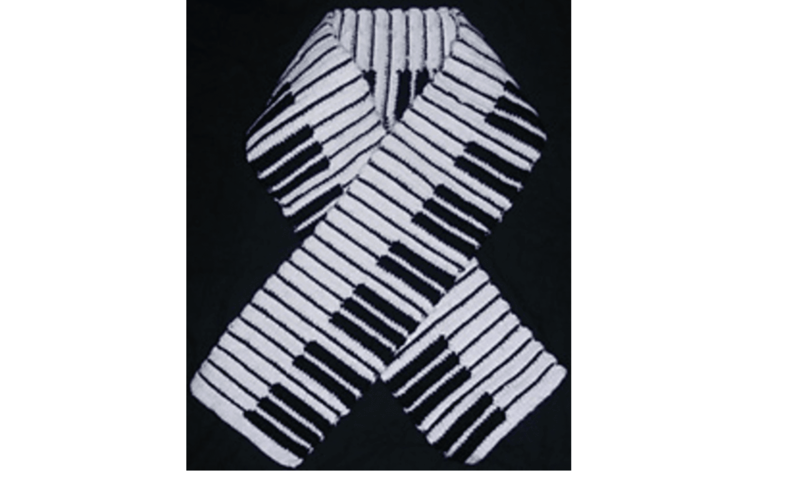 Rachel Choi of the Crochet Spot Blog created this free crochet scarf pattern that looks like the keyboard of a piano. What a perfect accessory for any music lover! Once you get the pattern repeat down you can easily make a crochet scarf of any length. The pattern also has great tips to make the process easier. Witch WolfWeb Creations offers a set of free crochet chart patterns for flute music lovers. If you know how to read a filet crochet chart or graph chart then you'll be able to use these free patterns to create crochet squares for blankets or other projects. Christine Frazier has created a crochet blanket pattern that incorporates several different musical symbols. This is a free pattern download through Ravelry and like the above flute pattern is a crochet pattern based on free graphs. Jacqueline Bartee offers a number of free crochet music note graph patterns through Ravelry including this treble clef pattern. They are designed to be made in thread crochet but if you adapted to a larger hook and yarn you could use the pattern to make a small blanket. Made in thread as designed, you'll get a great table runner or a piece of wall art that you can frame. Chinami Horiba offers a free crochet symbol chart for this adorable violin. Remember that symbol charts are different from graph charts (which are used in the three previous patterns). There aren't any written instructions so you need to understand these types of charts but as long as that's familiar to you then you can make this crochet violin appliqué. Carmen Rosemann also provides us with a free crochet pattern based on symbol charts. She also includes step-by-step photos with the pattern to make crocheting these music notes easier. There are three different musical notes included in this free appliqué pattern. What if you don't like to use symbol charts or don't yet know how? That's okay, there are written crochet patterns for music lovers, too. This pattern for music notes by Joy Morgan is a great place to start. Sarah Freisberg of Tangled Happy created this easy, free crochet pattern for a guitar strap based on granny squares. This is a great way to personalize your guitar. Gatuxedo blog has an easy free crochet pattern for this purse inspired by the design of a piano. You could easily alter the color of the purse to suit your own personal style while still keeping the piano keys the same. Donna Collinsworth of Donna's Crochet Designs shares this free crochet pattern for an amigurumi guitar. It's designed to be sized to fit an American Girl doll but you could use it for anything that inspires you.